The Goodies Factory was quick about getting my orders delivered. Since we only had a few days in which to go out selling, we were thankful for the quickness in the delivery. I will definately do business with this company again. Kids love popcorn fundraisers. They’re great moneymakers because the customers enjoy the wide range of choices and great flavors. The Goodies Factory makes a variety of flavors, whether it’s savory treats like Jalapeño or White Cheddar, crunchy flavors like Buttery Caramel and Chicago Style, or sweet dessert flavors like Cookies and Cream and Peanut Butter Chocolate. This brochure also features gourmet snacks and chocolates. There’s something for everyone! Parents interested in healthier snacks will love the fact that your fundraiser popcorn pops in a heart-healthy air popper versus an unhealthy oil popper. 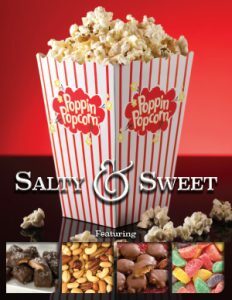 This brochure includes the following popcorn flavors: Buttery Caramel, Cheesy Cheddar, Nutty Caramel, Cheddar Jalapeño, Texas Cheddar Habanero, Three Cheese, Chicago Style, White Cheddar, Cheddar & Sour Cream, Kettle Corn, Movie Theater Butter, Cinnamon Toast, Chocolate Delight, Peanut Butter Chocolate, and Cookies & Cream. Setting up a sales table outside a high-traffic retail location is a great way to reach a whole new audience. Get permission ahead of time from the store manager. Weekends are the best time, so pair up at each location in two-hour shifts. Use large signs to let people know who you are, what you are doing, and why you are raising funds. Example: All Star Baseball Team Popcorn Fundraiser; Help Us Get To The Regionals!